Capsule Summary: Colonel Blake is brought up on charges courtesy of Majors Burns and Houlihan, so Hawkeye and Trapper must come to his rescue. 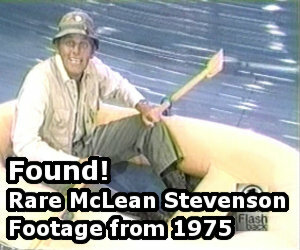 This was the first and only episode of M*A*S*H to be written by McLean Stevenson. He had contributed the story for “The Army-Navy Game” during Season One but the script for that episode was written by Sid Dorfman. It is also the only episode of any television show ever written by Stevenson. I’m sure he was able to turn to some of the talented scriptwriters who worked on the series for advice and input. His script was also no doubt refined, like any other, before it eventually hit the air. It’s a great episode. Stevenson had a real feel for not only his character but all the characters. Like the numerous letter home episodes, “The Trial of Henry Blake” takes snapshots of the 4077th and weaves them into a single storyline. The highlight of the episode is without a doubt Klinger’s attempt to escape the camp using a hang glider, resulting in the sightings of a big red bird with fuzzy pink feet. That was the most ambitious special effect tried in the first four years. I know people like it, but I always felt it was so obviously what it was, it departed from the realism we always tried for. I can’t think of any similar special effects used after Gelbart left M*A*S*H. He does have a point, though. It is obvious that Klinger wasn’t really flying off. Still, it’s a hilarious scene. I do wonder why Hawkeye and Trapper were in such close proximity to one another with their respective nurses. Notice that the quality of the film during the flying sequences is pretty rough, suggesting that when the episode was remastered for DVD those sequences couldn’t be cleaned up for some reason. My second favorite part of the episode is Frank telling Igor to only paint the top half of the rocks and to turn them over every night. Third would be the entire Kentucky Derby gurney race scene. Radar going with Colonel Blake to regimental headquarters makes no sense. He should have had a lawyer of some sort not a company clerk. Radar wasn’t much help at all, even ignoring the two continually bumping heads. Radar had to be there so he could head back to the 4077th and inform Hawkeye and Trapper of Henry’s arrest while stress eating. It’s also hard to believe that Radar wouldn’t have told Hawkeye what was going on before leaving for HQ, even if Blake had ordered him not to. Meg Cratty would return in “The Kids” during Season Four, this time played by Ann Doran. Does anyone know why Radar’s dress uniform is a different shade of brown than Blake or General Mitchell’s uniforms? Major Murphy’s uniform is also a slightly different color the Mitchell’s. On the topic of General Mitchell, I find it hard to believe he wouldn’t know what a gurney was. In at least two scenes you can see a patient on crutches in the background. There’s also a patient in a wheelchair. Little things like this really help make the 4077th feel like a bustling camp. Special and visual effects were kind of primitive back then, so the rough-look to Klinger’s hang gliding stunt is probably just nothing more than the look of film stock overlaying film stock. Notice in “There’s Nothing Like a Nurse,” the picture also looks a little rough when we have the split-screen of Frank and Margaret on the phone. Also, in almost every episode, the brightness and the contrast of the picture is decreased whenever the scene fades in or out, or if there are credit overlays. But aside from that, Klinger as a big red bird with fuzzy pink feet sure is hilarious, and I think the fact that the special effects were on the primitive side only added to the hilarity. This episode shows us a side of Henry that became a little more commonplace in the following season, in which we can see that he clearly does have a serious side, and I truly believe had Mac Stevenson stayed, Henry could have really developed and evolved into a more dimensional character as opposed to the lovable buffoon he was known for. “Aid Station” is probably another episode where his serious side shines through and we see that he can actually be fairly competent as a commander. Such a funny episode from an immensely enjoyable Season 2. The snippets actually show that the doctors knew how to have fun in between working non stop on wounded or trying to stay sane during bombings on their camp. I love Henry calling out the names of the gurneys during the race especially “Bouuuuuuncing Bettttty.” LOL. There are a lot of memorable lines in this episode. Major: Charge 3 states that there is a transvestite in your unit, colonel. Henry: I never pry into a man’s religion, sir. Meg (pointing to a pregnant local woman’s belly): This is a sample of Henry Blake’s work. I wish that McLean had written more episodes for the show. This and his contribution to ‘The Army Navy Game’ resulted in very funny episodes. All in all, fantastic episode and eminently rewatchable. > Also, in almost every episode, the brightness and the contrast of the picture is decreased whenever the scene fades in or out, or if there are credit overlays. That’s something that first popped up when the episodes began getting a cleaning around the time that the Columbia House tapes first started rolling out. The stark difference between the fade in/out shots vs. all the other shots didn’t exist during the CBS run, or during the first several years of syndicated reruns. My guess is whatever process was used at the time for the cleaning wasn’t able to do the proper color adjustments to the fade in/out shots or the credit overlay shots. Interesting. Wish I could see some examples. The reason the film looks bad during fade in/outs is because of the optical processing used to create the dissolves in and out of black. It may seem very simple, but it’s actually a special effect, and it would degrade the film. This was a very common issue with MASH and many other shows mastered on film. Before CGI, when fx were optically created, anything that changed the original film, be it Klinger’s glider, the credits, or dissolves, would degrade the image. It has nothing to do with a remastering process. The reason you see it now it because the DVD’s feature a higher resolution and more stable image than the show ever had when broadcast or on VHS. That actually makes sense; I see from other film shows back in the day, whenever there’s an overlay (like subtitles or something), there’s suddenly extra film grain and distortion to the image that wasn’t there before. I don’t see a lot of decrease in brightness/contrast on other shows like I do M*A*S*H, however. Conversely, videotape didn’t quite have this problem, however, back then, videotape technology was so primitive that overlays looked rather poorly done: credits weren’t properly aligned, subtitles were crooked, things like that. I know it’s kinda late to post this but the reason the shades of brown on Blake’s and Radar’s uniforms are different is because Blake’s an officer and Radar’s an enlisted man, or even more technically a non-commissioned officer. As for the nurse’s uniforms being a different shade of grey I have no idea, my only guess would be that they’re junior officers and Blake, General Mitchell, and the Major guy are all senior officers. What puzzles me about this episode is that when Hawkeye and Trapper plan to go to Henry’s hearing with Meg Cratty, Frank has them arrested and never says what the charges are. In the USA, you don’t detain someone without a legitimate reason. Just how far did Klinger think he would get o a hang glider? Even launching from a hill three times as high he’d have come to ground within walking distance of the camp. And while it is not impossible that Klinger could have obtained or built a hang glider, it is improbable. Vehicles qualifying as hang gliders were known in the late nineteenth century, and the double lobe design such as Klinger uses are found in photos from the 1930s. But the device remained an aviation curiosity, little known beyond enthusiasts, until plans and kits became easily available in the early sixties. And the one Klinger has looks very much like one of those sixties kits. It would have been more realistic to have him construct a kit plane or motor glider, both were highly popular in the post war years. Too noisy? And an aircraft might have been shot down, as well. I guess Klinger was trying to “sneak out”-by wearing a bathrobe with pink fuzzy slippers. The scene looked more like a nod to the hang gliding craze that was popular in the Seventies. I suppose it could be interpreted in different ways, but I love the final scene when Henry returns to the camp and everyone is all lined up in their nice wing-tipped shoes and Klinger steps out of line to give him his flowers. He even holds his handbag good and straight like a real soldier.